>In starting this new little series I forgot to do an intro! 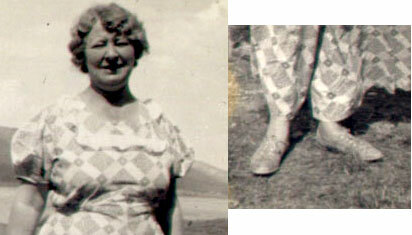 “What Real People Wore” is just what it says- the clothes of everyday people doing everyday things. These people can be movie stars, big wigs, farm folk, family, or just the average Joe, but in doing this I want to bring fashion off the magazine page and the movie screen and into the realm of reality. The goal in this is to provide glimpses of attainable fashion- what folks wore when they didn’t have stylists waiting off camera to brush away stray hairs. I’m hoping to pair this, occasionally, with shots of higher fashion or prepared advertisements for styles so you can see the way the fashion was intended and the way it transitioned to everyday people. I love high fashion as much as the next gal, but I think in studying this period it’s absolutely fascinating to see what people in my walk of life would have worn. Since the advent of photography we have been lucky to have more research materials about the clothing of our ancestors. When the box camera took photography to the average person we see much more clearly what everyday life was like and not through the eye of a painter who often, though not always, romanticized life and interpreted clothing and looks. A friend mentioned that what she likes about old photographs is the curiosity behind what happened the moment the shot was snapped- and I often think of that myself. It lends a sort of life to these beyond just the image. Seeing people enjoying life is thrilling and seeing when they’re made up in their best is inspirational- just as much as seeing men push a car to start it or gals running about fields of flowers, or children all dressed up on Easter Sunday, or a family on a camping trip. I hope you get as big of a kick out of this study as I do! I was fortunate enough to stumble on a large box of photos from the same family and seeing their transition in life from the 1920s to the 1950s was inspiration in itself. 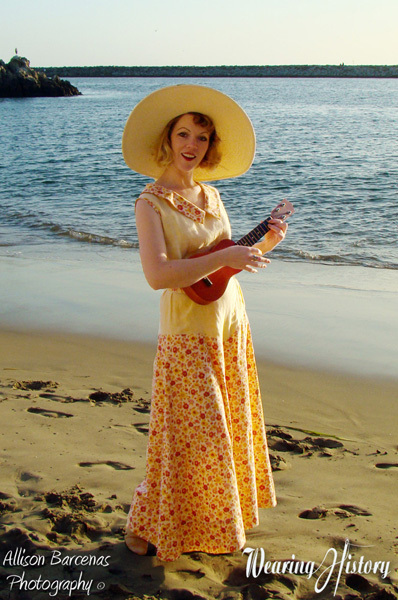 Although I didn’t pick up all the photos I did commandeer quite a few and this smiling lady in her beach pajamas warms my heart. There were quite a few of a family out on a farm from the 1920s and early 1930s and she is one of those ladies. Usually when I think of this style of clothing I think of the high fashion Riviera of the late 20s and early 30s- wafer thin girls with long legs, perfectly manicured hair, and large hats just lounging around glamorously. This lady seems as pleased as punch with her new beach pajamas and she’s nothing like the image I had concocted in my brain of this style. Her pajamas are cotton, most likely handmade or from a mail order catalog, and she’s wearing them out in a field in what looks like California. Her hair is fingerwaved and she’s wearing lace up shoes- perhaps sneakers or beach shoes (maybe they were planning and outing)? Any thoughts? 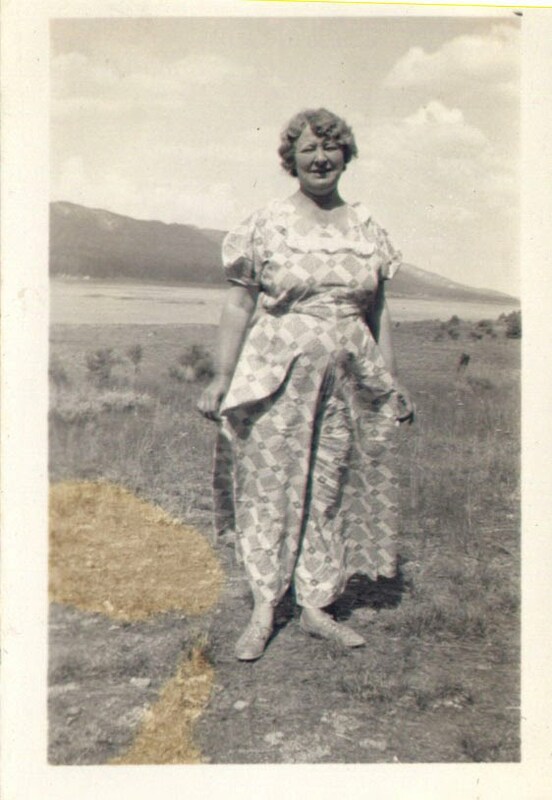 And she’s not the wafer thin socialite, but a happy farm woman, unashamed of her figure and the fit of her clothing but just as happy as can be in her new fashion. Notice that she has no constricting undergarments on underneath this, and the length of the trousers, when not windy, probably hit just above her shoes. Any bets on the color of these beach pajamas? I would bet peachy-pink, jadeite green, and creame with a white ruffle. This style hit home as well in the way of lounging pajamas and kitchenette pajamas, but the way she’s wearing them and happily posing for the camera makes me think she didn’t mean them to be solely housewear. Here’s the pajamas I made up last year- perhaps the lady in the image did the same with a different pattern! You can purchase the pattern above on my pattern website– based on a vintage pattern and available in multisize. 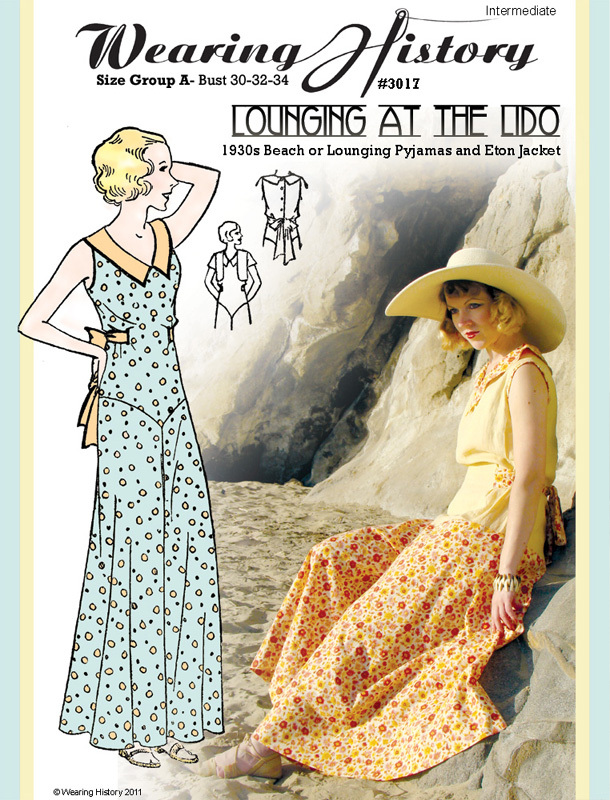 Here’s a fantastic post by ShellBelle with great images of 1930s beach pajamas. And two amazing posts of pictures by Baroness Von Vintage here and here. And two wonderful posts by The Painted Woman with great pictures of pajamas here and here. And a great French blog on the Pajama Fashion. >the beach pajama lady looks stoked! >I love that the beach pajama lady has the same figure as I do! I'm going to add some sort of not-for-bed-only pajamas to my to-do list. >Great series! Looking forward to the next ones! >She's so cute. Yeah for us fluffy chicks! >You know I'm loving this series. I'm clinging onto every word you say because I feel the exact same way when I look at old, anonymous photographs and "regular" folk. Only I can never quite seem to put it into words. >LOVE! Oh, by the way, your new profile pic is just drop dead gorgeous!!! !